The plane, which had 168 passengers on board, made a safe emergency landing at the Chhatrapati Shivaji Maharaj International Airport here at 12.15 pm. The aircraft safely landed back at the airport here under emergency conditions at 12.15 pm. 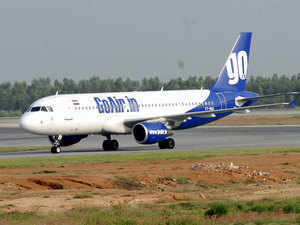 MUMBAI: A Pratt & Whitney-engine powered A320neo plane of GoAir returned to the city due to "high engine vibrations" after an hour of its take-off for Delhi Thursday, a source said. The plane, which had 168 passengers on board, made a safe emergency landing at the Chhatrapati Shivaji Maharaj International Airport here at 12.15 pm, he said. The aircraft safely landed back at the airport here under emergency conditions at 12.15 pm, the source added. A query sent to P&W on this issue was awaited. This is the first incident of US-based firm manufactured jet engine experiencing in-flight vibrations after the government giving a clean to these engines on following a stakeholders meeting in New Delhi on Tuesday. Significantly, the clearance to the P&W engines came a day after the US aviation firm announced extending sponsorship for an aviation event being hosted jointly by the civil aviation and commerce ministries,industry lobby Ficci and Airports Authority of India.